As we mentioned last week; the traditional meal for Good Friday is fish, or at the very least, seafood. It’s a great day to sample some of our famously fresh seafood, with a glass of our wine to match. A quick stroll through the fish markets can make it hard to decide on which seafood to serve, so here are some of our favourite seafood and wine pairings to help you. The archetypical Australian white fish, with the archetypical Australian white wine. Chardonnay did lose some of its street cred a few years ago, but when you sample the oaky notes of a chilled Chardonnay against the soft, buttery flavours of the barramundi, you’ll see why this staple white wine is making a comeback as big as the barramundi itself. Fresh oysters are hard to beat, and oysters and white wine are a match made in heaven. If you prefer your oysters cooked in sauce, or with bacon or ham; then you’ll want to venture out and trial some medium-bodied red wines to go with them. However, for those of us who like our oysters “au naturale;” the soft floral notes of the Sauvignon Blanc perfectly quench the salty tang of the oysters, without overpowering the overall flavour. It’s a standard practice to pair white wine with fish, even if the fish is pink fleshed. However, our Pinot Noir pairs incredibly well with salmon, even if you enjoy it raw. Our favourite recipe for salmon involves a little soy and some sesame seeds, which pairs perfectly with the delicate cherry notes of the Pinot Noir. 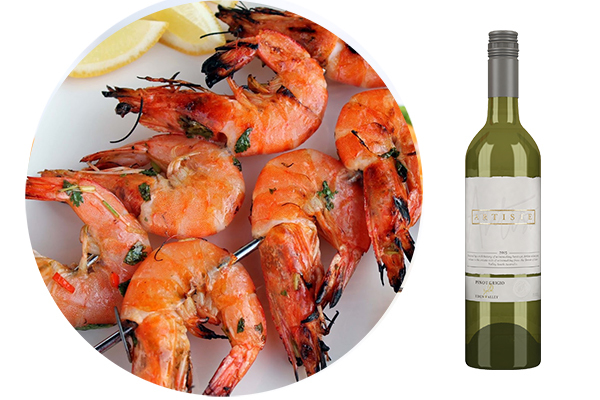 We suggest partnering your prawns with a glass of chilled, Australian Pinot Grigio. The fresh, crisp and fruit flavours of the Pinot Grigio will act as a terrific counterpoint to the meaty, flame-grilled flavours of the prawns. However, for an “out of the square” match, here is pairing that may surprise you -the charcoal flavours of barbecued prawns can pair wonderfully well with one of our big, bold our reds such as a Shiraz or Cabernet Sauvignon. To be honest, this dish doesn’t have to be so specific. We just really love this hot and spicy dish with juicy lumps of white fish. The main point is, if you’re spicing up your fish, then even though a crisp white wine may seem like a great choice, consider a glass of our off-dry Riesling instead. The slightly sweeter palate pairs beautifully with spicy foods. Whether it’s with Mexican-style fish tacos, Southern-styled crawfish with hot sauce, or even Goan fish curry; the citrus flavours in the Riesling help to cut through the overwhelming flavours of the spicy fish. The sweet notes also help to calm things down if the spice gets too much. We hope this list helps you surprise and delight your guests, but as with all food and wine pairings, the options are limitless. Talk to your local fishmonger, experiment, and enjoy the endless flavours of fresh fish and great wines.